It’s almost here now folks. 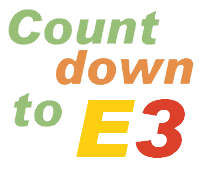 E3 2011 is just four days away. It’s time to kick our countdown up a notch. All of our features so far have looked back at the past of Nintendo. Today we turn our gaze to the imminent future, and take a look at what we’re expecting to see from Nintendo at their E3 press conference this year. From the reveal of Project Kafei, to new Wii and 3DS games, there is a lot to get excited about this year. There is no way that Nintendo will flop like in 2003. In fact, it will be more like 2004, or 2010, or more likely – even better than both. So come on inside for my rundown of everything I’m expecting and looking forward to at E3. Well, not quite everything – you’ll notice that there is no mention of anything Zelda. That’s because we’ll have an exclusive Zelda-dedicated feature tomorrow. Stay tuned for that, but in the meantime, read on for a look at everything Nintendo. The big announcement of the Wii’s successor is confirmed to be at E3. Nintendo isn’t usually one for going on about the tech specs, but that’s exactly what I’m expecting. I think we’ll see a thorough display of the console’s hardware, and what it’s capable of. I’d also expect some of the launch titles to be announced, and some of the rumors clarified – such as whether there’s a new Smash Bros. in development and whether GTA 5 is coming exclusively to Kafei. Perhaps some major upcoming titles will be announced like Super Mario for instance. With the arrival of Project Kafei, the Wii could very well be seeing the end of its days. We should expect to see a reminder that the Wii isn’t finished yet with some big software titles. Pikmin 3 has been in development for the Wii for years, and we haven’t heard any details yet. Kirby Wii is said to be coming this year, so we should learn something about this relatively unknown game. Hopefully an announcement of Pandora’s Tower’s release in the west. Trailer for Xenoblade chronicles and announcement of the US release date. Announcement for The Last Story in the US? I hope for some surprise revealings of big new software to see out the end of the Wii. Perhaps a New Super Mario Bros. Wii 2? There are lots of possibilities. Nothing is really expected for the DS, but this is its last chance for some big final showings before the 3DS completely takes over. I’m not really sure if we should even expect anything though. Announcement of release date for Professor Layton and the Specter’s Flute for the West. There’s lots of stuff going to be shown off (and maybe shown) for the Nintendo 3DS. Let’s have a look. Announcements of upcoming titles on the 3DS eShop. Given that the shop launches the day before, we could expect some new titles to be available directly after their announcement at the conference. Kid Icarus: Uprising – lots more details, a trailer and a release date. Star Fox 64 3D – Trailer, details, and release date. Super Mario 3D – Full details, trailer and a release date. Paper Mario 3DS – Trailer, details and date. Mario Kart 3DS – Trailer, details and date. Professor Layton and the Mask of Miracle – Date, trailer and details. Animal Crossing – Details, date and trailer. Lots of other announcements, such as Donkey Kong 3D, Pokemon 3D or Dragon Quest 3D, can be expected.